September 9th, 2017 will be the sixth annual Solidarity Demonstration in prisons across the United $tates, an opportunity for prisoners to commemorate the anniversary of the Attica uprising and draw attention to abuse of prisoners across the country through a 24 hour work stoppage and fast. 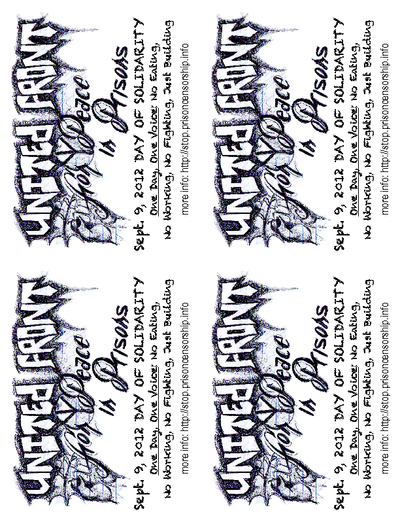 This demonstration was initiated in 2012 by an organization participating in United Struggle for Peace in Prisons and has been taken up as an annual UFPP event, with people committing to participate in prisons across the country. You can read some reports about actions in previous years including a series of reports from California in 2016 and a report on the parallel demonstrations initiated by the Free Alabama Movement. Further readings include a summary report for the 2015 activities and a 2014 report as well as some 2013 protest of hunger strikes, fasting, work stoppage and other activities in Texas, Nevada, Georgia, Arkansas, Michigan and Maryland. This demonstration aligns with the UFPP principle to build unity among prisoners who have a common interest in fighting the oppression of the criminal injustice system. Prisoners are taking the 24 hours to engage in solidarity building and education, ceasing all prisoner-on-prisoner hostilities. This is a critical step in building a United Front among prisoner organizations and individuals committed the anti-imperialist movement. We do not need to agree on every political issue, but we must come together united around core principles to build and fight together. The unity building starts well before September 9th for those who are engaging others to participate in the protest. It is a long slow process of education and organizing to build the anti-imperialist movement. Those on the streets can distribute this flyer to support the struggle behind bars. Rebuilding the anti-imperialist prison movement means uniting all who can be united around the common interest of the U.$. prison population in solidarity with the oppressed people of the Third World. Various tactics have been used by the state to promote and exacerbate existing contradictions among the lumpen, leading to the acceptance of the capitalist ideology of "Do me." Torture, abuse and lack of freedom faced by the oppressed nations and particularly the imprisoned population can only be addressed by building bridges along common interests and focusing our struggles on the real enemy - the imperialist state. This page will serve to collect the statements of unity received from groups who are working in solidarity with the United Front as well as reports on the progress of efforts to build peace and unity in U.$. prisons. Study, spread and promote the 5 principles. I have received your envelope, thank you, however the enclosed material was taken by Media Review and denied me due to "inciteful material throughoug." This newsletter has never been an issue until now, and I believe the move is more retaliatory and harassing than being of any actual concern. Either way, I have appealed the decision to Central Office. They ask that the senders send an appeal letter as well, if possible. I myself have tried to explain the newsletter via a quasi-political/philosophical bent, promoting re-education of the offender and the individual. Promoting unity, peace and communism and specifically denouncing chaos, violence, etc.